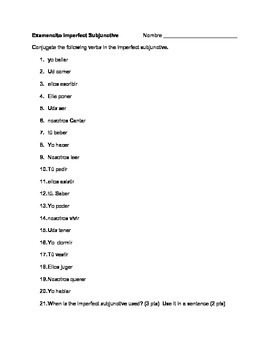 This quiz could also serve as a worksheet and is a list of 20 verbs that students conjugate in the imperfect of the subjunctive. There is also a question about its use and using it in context. I have included an A and B version of the quiz. Check out my Imperfect subjunctive bundle that includes notes and a worksheet too.